These small eagles are very territorial to their wooded, hilly terrain. They share a strong pair bond and always lay two eggs, of which only one chick ever survives. They are very versatile and rapacious hunters and take large prey (game birds and small mammals) in relation to their size. This they hunt by swooping from a perch, quartering low over the ground or stooping from a soaring position. They have even been known to follow their prey into a bush on foot! 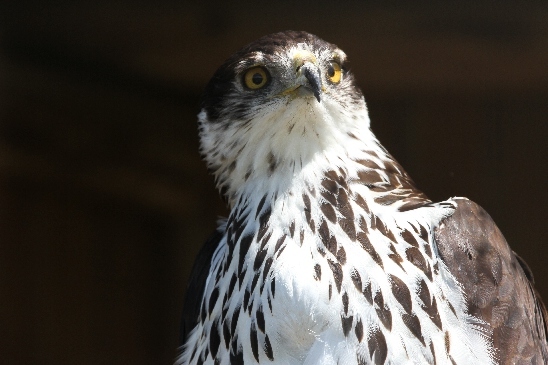 The African Hawk Eagle that you will meet at the Sanctuary is called Shikari. This female fell out of the nest as a young chick and was hand-reared at Moholoholo Rehabilitation centre. When they released her at their facility she proved to be a semi-imprint (relating to people, not their own kind) and hung around causing havoc. She was caught up again and transferred here where she will be put in a breeding program. Hawk eagles lay two eggs, but only one chick ever survives.